The serpent with six hoods is the Kundalini Shakti, the divine power asleep in the lowest physical centre which, awakened in the yoga, ascends in light through the opening centres to meet the Divine in the highest centre and so connect the manifest and the unmanifested, joining spirit and Matter. The sensation in the spine and on both sides of it is a sign of the awakening of the Kundalini Power. It is felt as a descending and an ascending current. There are two main nerve-channels for the currents, one on each side of the central channel in the spine. The descending current is the energy from the above coming down to touch the sleeping Power in the lowest nerve centre at the bottom of the spine; the ascending current is the release of the energy going up from the awakened Kundalini. The movement as it proceeds opens up the six centres of the subtle nervous system and by the opening one escapes from the limitations of the surface consciousness bound to the gross body and great ranges of experiences proper to the subliminal self, mental, vital, subtle physical are shown to the sadhak. 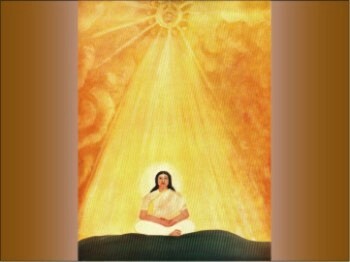 When the Kundalini meets the higher Consciousness as it ascends through the summit of the head, there is an opening of the higher superconscient reaches above the normal mind.